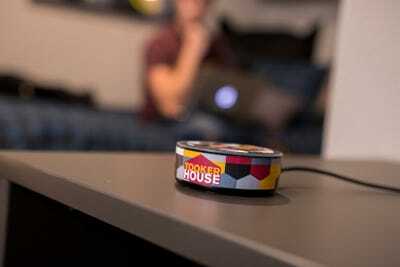 Arizona State UniversityOne of 1,600 customised Amazon Echo Dot smart speakers, donated by Amazon to Arizona State University. 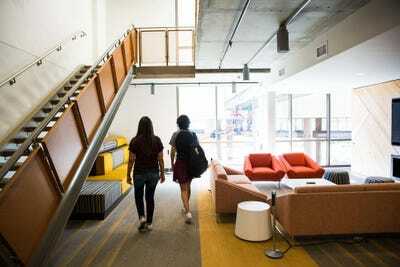 On Thursday, Arizona State University (ASU) marks the beginning of its fall term, which doubles as the grand opening for Tooker House — a brand new, high-tech dorm for first-year engineering students. Tooker House sports cutting-edge amenities, including a workspace with 3D printers and laser cutters for students to use. This dorm is designed to be the crown jewel for ASU’s Fulton Schools of Engineering, which it says is the largest engineering program in the country. But wait, there’s more: Every single one of the 1,600 freshmen moving into Tooker House is getting an Echo Dot smart speaker, retail price $US50, thanks to a one-time donation from Amazon. Notably, accepting the device isn’t mandatory, and some students may elect not to take advantage of the offer. The devices also come equipped with an ASU “skill,” built in collaboration with Amazon, which lets students quickly get information on the academic calendar and events on campus just by asking the Echo’s Alexa digital assistant. It also sports the normal Alexa features, including setting alarms and playing music. For ASU, it’s a way to ensure its students stay on the cutting edge. For Amazon, it’s a part of a larger master plan to work out how it can use the Alexa assistant to own the future of computing. From ASU’s perspective, the Echo Dot speakers speak straight to the engineering program’s mission, according to Fulton Schools dean Kyle Squires. He says the Echo Dot speakers “merge the living environment with the learning environment,” with students encouraged by the school’s curriculum to build their own Alexa skills. For Amazon, the “first of its kind” ASU partnership speaks of bigger things to come in higher education, says Amazon Alexa director Eric King. For starters, it’s going to give students an incentive to build voice apps in general, and Alexa skills in particular. That’s good for Amazon and the Alexa platform as a whole. “It’s going to inspire the next generation of developers to use voice,” says King. Deanna Dent/ASU NowTooker House, ASU’s new high-tech dorm. Even the laundry machines have bluetooth to tell you when the cycle is done. In that light, King says the donation of these 1,600 Echo devices “was as much an investment” as it was a donation.